The FoTRRIS online platform is now directly available from the FoTRRIS website, under the “resources” header. 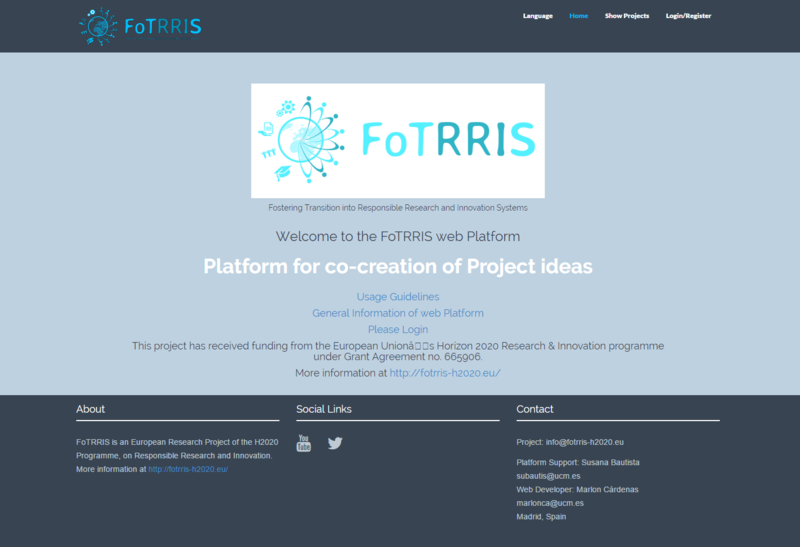 This platform allows the FoTRRIS’ transition arenas and their related competence cells in our five countries (Austria, Belgium, Hungary, Italy and Spain) to work collaboratively on designing a co-RRI research project concept. Transition arenas are spaces where various actors of all kind (research, civil society, business, policy, …) can work together on unravelling the causes of grand societal challenges and develop research project to address and solve these challenges, in a responsible way. FoTRRIS partners support these actors through this process, bringing in their co-RRI and facilitation skills, that’s why we call them the “competence cells”. The online platform embodies a specific architecture consisting of various phases, supported by various tools to guide users in this process, such as a collaborative pad and a chat box. It also serves as a repository to document the process. Designed and hosted by our partner UCM, the platform displays the six FoTRRIS cases (respectively sustainable food in Austria, material scarcity in Belgium, local economic development in Hungary, renewable energy in Italy, women and disabilities and refugees in Spain) along with other cases of study, developed at UCM (as an example: Corporate Social Responsibility case, developed by UCM master students). Anyone can have a look at the projects displayed on the platform through the “Show Projects” header. It is also possible to register and select one or several projects. However, the project manager of the project(s) selected has to accept your request before you can effectively join the online discussion. More is available on our FoTRRIS website to learn about the six local transition experiments.